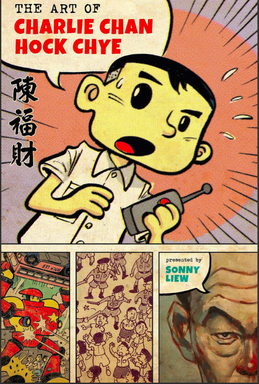 Further exploring Asian comics thanks to Paul Gravett's Mangasia, I am very thankful to have read my first comic from Singapore, Sonny Liew's fake biography The Art of Charlie Chan Hock Chye. I would have found a straight-up history of Singapore fascinating, if I'm being honest. It's not a country I've ever really considered and therefore, it was all new to me. Told in a graphic novel format, even better. Told as part of a fictional biography of a comic artist and simultaneously a love-letter to the medium? Now we're really talking! It helps immensely that Sonny Liew has an amazing illustrator's talent as well. Showing supposed art of Charlie Chan as it progressed through his life, drew inspiration from manga and American sources (like MAD Magazine), can only be accomplished by someone with real appreciation and skill. (His chameleon-like artistry could be compared to R. Sikoryak's.) There was also an amusing tongue-in-cheek aspect to it where it subtly implies for instance that Charlie Chan's comics inspired the likes of Maus and Spider-Man, rather than the other way around.